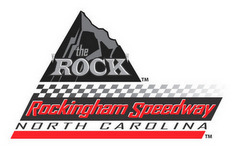 North Carolina Speedway (formerly North Carolina Motor Speedway, often refered to as Rockingham) is a 1.017 mile oval with an infield road course. Banking is 22 degrees in turns 1 & 2 and 25 degrees in turns 3 and 4. 2004 was the last year of NASCAR oval racing, but the road course is still in service at a low level for club events, and apparently there is a kart circuit in the infield which is still in use. The track was purchased at auction on October 2nd, 2007. The new owner has extensive plans to revive stock car racing at the facility. Chump Car World Series from 3/12/2011. Car is a 76 Nissan 280z running 215 Falken Azenis street tires. Nascar turn 1 was blocked off forcing the cars down onto the apron.